Harris Tweed is unquestionably one of the most interesting fabrics in the fashion world. Still hand-crafted and hand-woven in the Outer Hebrides, Harris Tweed has been called the “champagne of fabrics,” and for good reason: it’s sturdy, comfortable, natural, and in most cases utterly indestructible. From Yves Saint Laurent to Nike, numerous designers and companies have used Harris Tweed, and it seems like every fabric company in the world has tried (unsuccessfully) to create fabrics that mimic the distinctively perfectly imperfect fabric. Harris Tweed: From Land to Street is a beautiful book that attempts, through photographic vignettes and small bits of text, to capture the feeling of Harris Tweed. This is no small endeavor: part of the appeal of Harris Tweed is in its texture and feel, something difficult to represent on paper. Nonetheless, Lara Platman’s book does a phenomenal job of capturing a little bit of the essence of Harris Tweed, following it from its wooly beginnings to its finely crafted result. Harris Tweed begins in the hills of the Outer Hebrides and follows the wool through all of the various production processes it encounters, along the way providing brief biographies of men and women who spend their lives making beautiful fabric. Make no mistake: Harris Tweed: From Land to Street is not about providing endless pictures of tweed blazers or fabric swaths. Rather, it is an adventure through the hills of Scotland, following the relative MacGuffin of tweed as it shows those who work their lives around it. The message, in short, seems to be that Harris Tweed is not just an amazing fabric: it is a lifestyle for many who live in a quaint pocket of the world that most of us will never see. 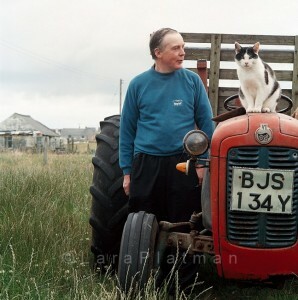 Of course, the real value in Harris Tweed: From Land to Street is in the photographs. With every photograph, you pick up a little bit of the Scottish tweed culture — the beautiful scenery, the unassuming buildings, the beautiful fabrics, the tough but skilled laborers, and the effects of the sartorial masterminds in Seville Row. One can almost smell the fabric through the pages. The book’s photos are rife with little details that really make the entire book shine — given a magnifying glass and some time, one could undoubtedly find all sorts of interesting details hidden in each photo of the book. If I had any complaint about Harris Tweed: From Land to Street, it would be that the book fails to have the kind of payoff sartorial geeks like myself enjoy. While we see, in great detail, the crafting of the fabric itself, we rarely see it “in action” quite like we would like. I found myself pondering where some of the fabric followed in the book ended up — I wanted to see the finished product, not independent pieces of the product in making. 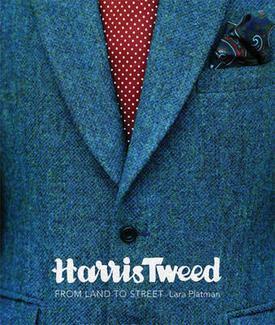 With that being said, though, that’s simply not the message of this book: Harris Tweed: From Land to Street is about the process, not the product. Images from the book Harris Tweed: From Land to Street by Lara Platman. 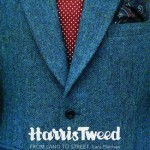 Harris Tweed will be availble in October, and you can pre-order the book at Amazon.com for $27.